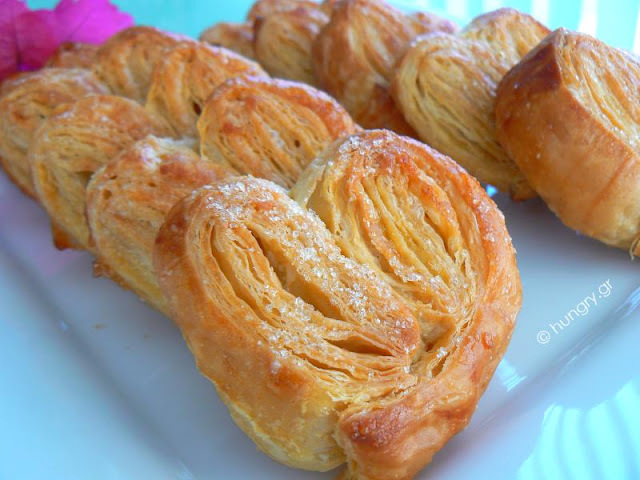 A Palmier is a French pastry made with puff pastry and sugar. The are crisp, caramelized and delicious. 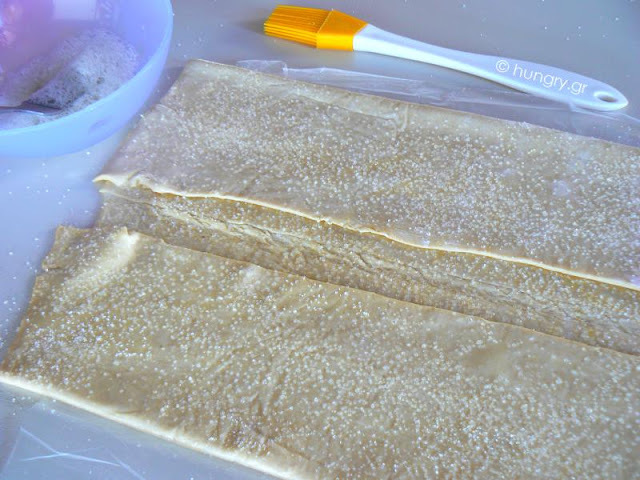 They are easier and simpler to make if you use ready puff pastry. The idea came from Nadji's beautiful blog. 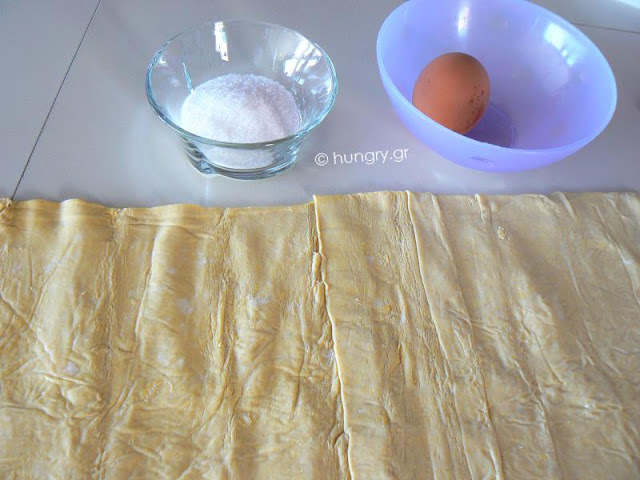 Spread the puff pastry and press with a rolling pin to flatten. Fold in half along the long side, to find the exact middle. Beat the egg white lightly. 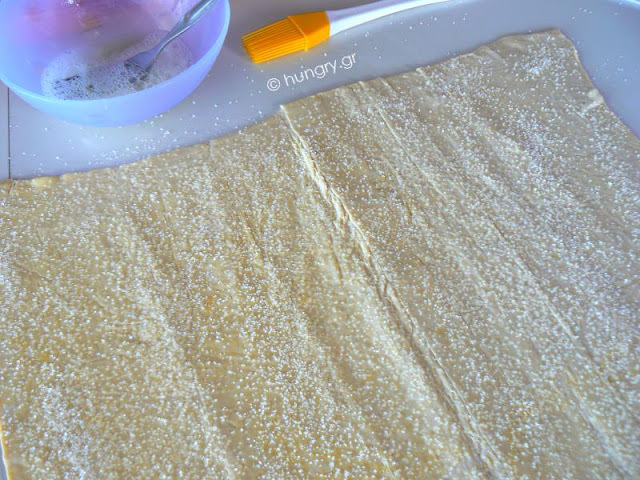 Open the folded sheet, brush with the egg white all over the surface and sprinkle with lots of sugar. 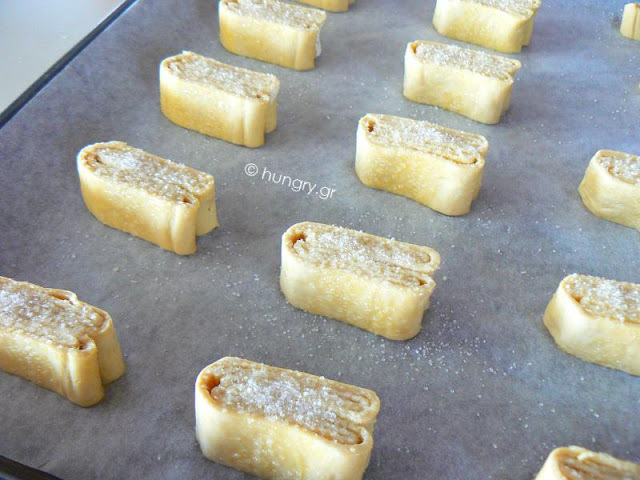 Fold the two short sides toward the middle, leaving 1 to 1.5 cm/ ½″ gap at the center. 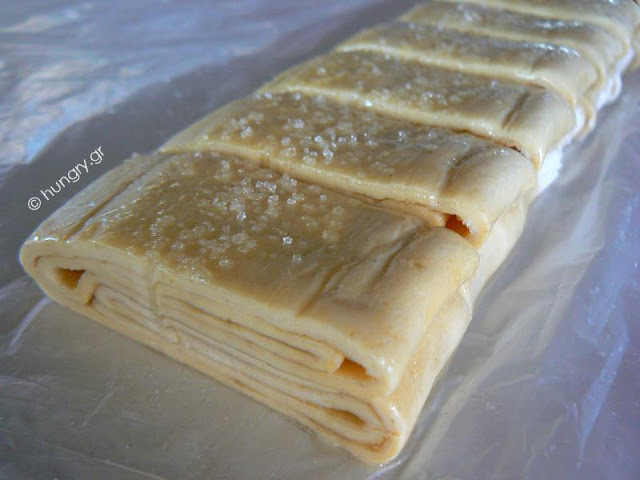 Brush with the egg white and sprinkle with sugar..
Refold the package onto the already folded. Brush with egg white and sprinkle with sugar. Looking from the side we should have 4+4 folded sheets. 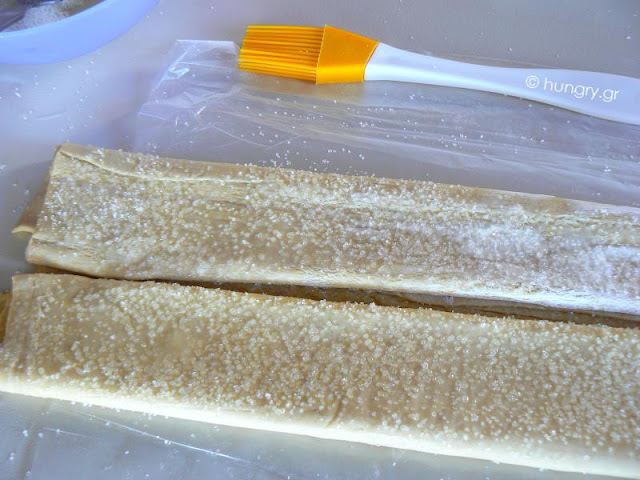 Place the pastry in the refrigerator for 20' to make it easier to cut. With a knife cut the leaves in thickness 1.5-2 cm/ ½″-1″. 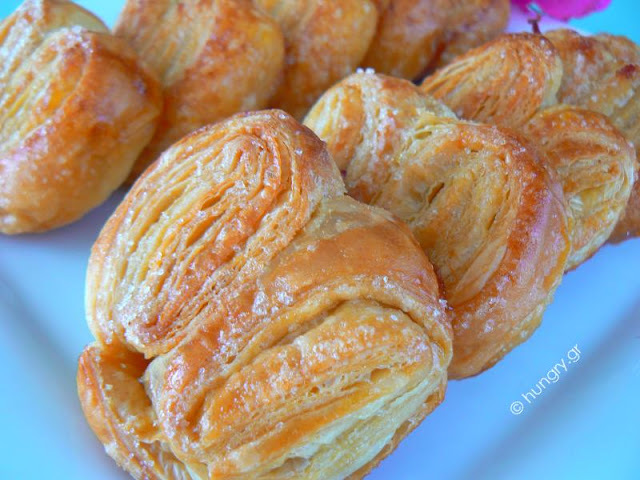 Spread a nonstick baking paper on a pan and cut place the pastries with a distance between them. Put in preheated oven at 200°C/ 400°F/ Gas Mark 6 for 30'. At 15' turn them to cook on the other side. Remove from the oven and place onto a rack to cool. 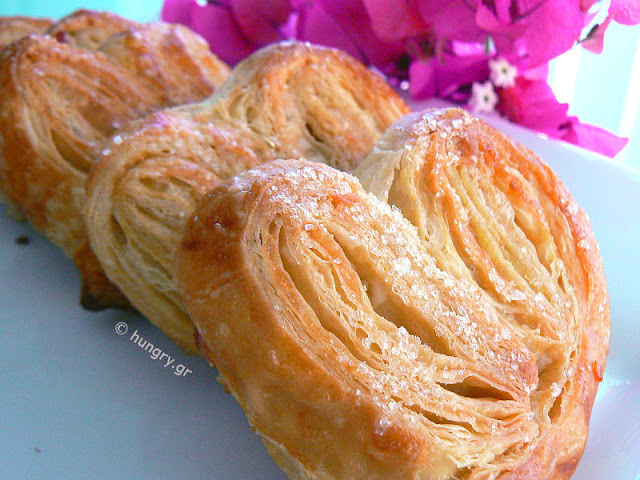 Fine taste, crisp crust and soft golden pastry filled with fragrant pear and cream cheese. If this combination inspires you, create and enjoy a very delicious dessert with pears. A fruit that is not our first choice for desserts, which is usually an apple.